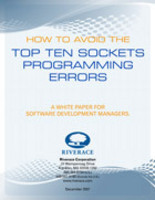 Riverace Corporation has released its new white paper, "How to Avoid the Top Ten Sockets Programming Errors: A White Paper for Software Development Managers." The white paper is available for immediate download at http://www.riverace.com/sockets10.htm. "Developing software is a costly endeavor," says Steve Huston, President of Riverace, "and most of the development cost is in the testing and maintenance stages. This is because developers can't catch sockets programming errors as they occur -- the traditional tools and techniques introduce too much accidental complexity. It's too easy for developers to do the wrong thing and the API (application program interface) is too complicated. With the developers we work with, we kept seeing the same socket programming problems repeatedly, so we developed this white paper to show them how to avoid these errors." Although the white paper is written for technical users, the content is reader-friendly and includes a quiz that developers can take to see if they can find the top ten sockets programming errors in a function. Readers will also learn how to develop error-free functions that use fewer lines of code and how to correct errors in seconds during compile -- versus hours or days at run-time. Readers will also be able to download -- at no cost -- ACE source code via a link in the white paper. The white paper can be found at http://www.riverace.com/sockets10.htm. Riverace is the premier provider of ACE -- the ADAPTIVE Communication Environment. A modern, high-performance framework and C++ class library, the ACE toolkit offers classes designed to resolve the complexities inherent in Sockets programming. ACE is easily portable to a wide range of today's popular computing programs -- from handheld devices to supercomputers. Riverace Corporation (http://www.riverace.com), founded in 1994, grew out of a tradition of high-quality consulting services specializing in network system and protocol development, and object-oriented development of distributed object systems. ACE has played a pivotal role in Riverace's successful history. Riverace delivers superior ACE software development, support, training, and consulting services with enthusiastic customers and their successful projects spread across the United States and around the world. For further information about the company's services, please call +1.888-384-8154 (U.S.) or 508-541-9180 or send email to info @ riverace.com.